Our custom fire pits are a lifestyle changing experience. There is nothing more enjoyable than spending time outdoors with your family and friends. 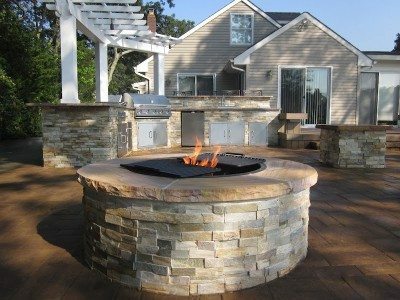 Outdoor fire pits make it possible for you to spend your evenings outside during the summer by adding the warm glow of a fire, as well as extending your outdoor season into the fall and winter months. Fire Pits aren’t just used in the cooler weather. Our fire pits can be filled with ice and used as a cooler during one of your summertime events or a lazy day sun bathing. Fire Pits can be built out of a variety of materials and can be used anywhere in the landscape. They can be a centerpiece of a backyard or tucked away as a private retreat for family and friends. Wood burning or natural gas features can be installed depending on your lifestyle. Green Island Design will walk you through all the options while always keeping safety in mind at all times.